We gratefully acknowledge the past Brescia Ball Honorees for their dedication to the motto of Serviam and Ursuline Academy’s mission. 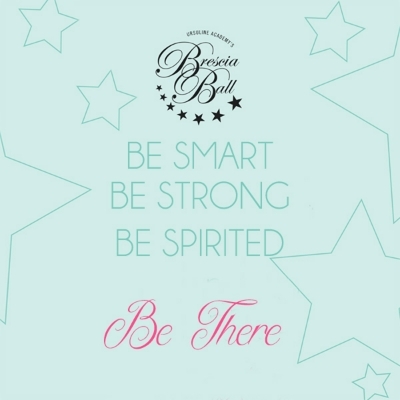 Brescia Ball 2015: Be Smart. Be Strong. Be Spirited. Brescia Ball 2014: Eat. Pray. Love. 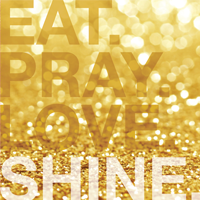 Shine. volunteers represented UA with grace and cheer. Shannon Lawler '15, as guest speaker, proudly recognized the night's honorees, her parents, Bob and Suzanne Lawler, and her aunt and uncle, Bill and Sue Lawler. A special note of gratitude goes to our parent committee leaders Tracey Finch, Sandra Giordano, Kate Gormley, Elizabeth King, Kathleen McDonald, Julie Steinkrauss and Stephanie Waldeck. Your contributions, combined with funds raised from sponsorships, ticket sales and item purchases helped us to raise over $125,000. See what a little magic can make possible! Brescia Ball 2016, held at The Lantana in Randolph, honored Patricia Leary Dowling '52 and Mary Jo Gorman Keaney '82. later, Pat remains a loyal annual donor and supporter, serving on the campaign planning committee and the campaign cabinet. Then as now, she is the very model of Serviam. Mary Jo Gorman Keaney '82 has devoted her life to education, and has the unique distinction of having served as the first lay principal of Ursuline Academy, from 2009 to 2015. 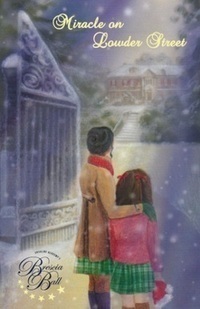 Mary Jo received her degrees from Bowdoin College and Harvard Graduate School of Education. She taught and served in administrative roles at Newton Country Day School of the Sacred Heart, Harvard University, and St. Peter School in Cambridge, where she served as principal for four years. Mary Jo recalls that it was Sr. Ursula who introduced her to Latin at Ursuline, and also credits Sr. Dorothy Doyle (Latin) and Sr. Mercedes (Spanish) for nurturing her love of language. Her devotion to and support of Ursuline Academy has been unwavering in all her years as student, alumna, and administrator, and remains strong today. Be Smart. Be Strong. Be Spirited. The 2015 Brescia Ball was once again a great success thanks to our dedicated and generous Ursuline community. The event hosted 310 people, including parents, alumnae, trustees, Ursuline Sisters, past parents, grandparents, faculty, staff and students who gathered to celebrate the legacy of St. Angela Merici, founder of the Order of St. Ursula. It was record-breaking event, realizing over $134,000 for the students of the Academy. The 2015 Brescia Ball honorees were David Putnam P ‘89 and Richard Osterberg, two former Trustees who have supported the mission of the Academy for many years. 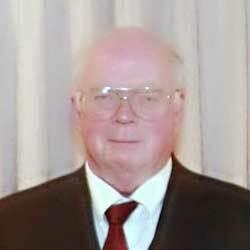 Mr. Putnam is the former President of F.L. Putnam Investments and the parent of two daughters from the Class of 1989. 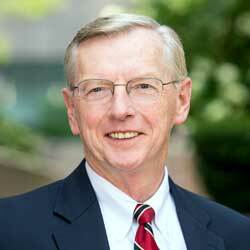 He is the past Chair of the Board of Trustees and served on the Board for 14 years. Mr. Osterberg is an attorney and member of Weston Patrick, P.A. He is the former Vice Chair of the Board of Trustees and former Chair of the Finance and Investment Committee. As friends and Trustees, Mr. Putnam and Mr. Osterberg are credited with leading Ursuline through expansive growth and dynamic change. They embody the core tenets of the Ursuline community; scholarship, leadership, and service. The 2014 Brescia Ball was a great success as 360 people gathered together to celebrate the legacy of St. Angela Merici and recognize our honorees. The event also raised $130,000 for the school. Thanks to all who participated in making the Brescia Ball a success, especially the planning committee led by Co-chairs Angela Canale P '17, '19 and Nancy McAdams P '15. 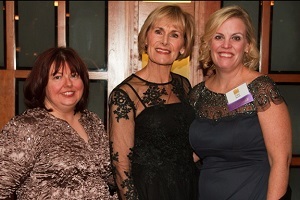 The 2014 Brescia Ball honorees were both alumnae, Eve Kelley '86 and Cara Gould '89, who have demonstrated Serviam in different ways. Eve has done so through her years of service to students through Campus Ministry retreats, and Cara as the Director of Camp Harbor View, a partnership with the City of Boston and the Boys & Girls Clubs of Boston. View images from the night. It is with deepest gratitude that I share this very good news with you: the 6th annual Brescia Ball, The Academy Awards, raised $110,000 for Ursuline Academy! By surpassing our goal as well as setting a new record, this year's event will allow us to make improvements to update and refresh our beloved Tea Room. The success would not have been realized without the dedicated leadership demonstrated by our two Co-chairs, Angela Canale P '17 & '19 and Nancy McAdams P '15. 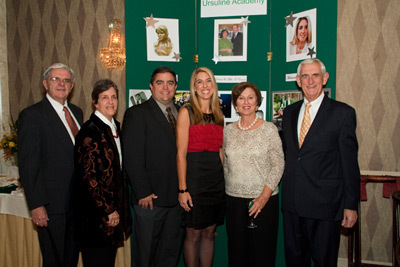 I thank them along with the many other volunteers and supporters who worked tirelessly to make the night a spectacular celebration of the mission of Ursuline Academy. The sense of community was demonstrated in so many ways: the students who assisted, the parents whose presence made the evening so special and the bidding so much fun, those who purchased raffle tickets but could not attend, the faculty and staff, as well as the Ursuline Sisters whose footsteps we follow as we continue the mission of St. Angela. We are blessed indeed to have so many who understand, embrace and live the motto Serviam each and every day. 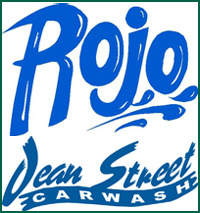 Thank you so much for all that you do for this vibrant community. Without your continuous support, none of this would have been possible. Thank You to the Brescia Ball Planning Committee! Any event of this magnitude requires the commitment and effort of many people. The 2013 Brescia Ball Committee includes the following volunteers. The 5th annual Brescia Ball on Saturday, Nov. 17 was a great success. The event was a wonderful evening in celebration of the Academy and recognized members of the community for their contributions to the school. The Brescia Ball raised $85,000 for Ursuline. Many thanks to all who joined us in making the evening a success! 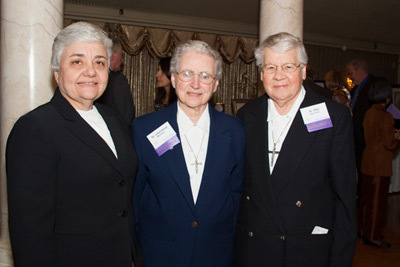 (l-r) Honoree Sr. Bridget Haase, o.s.u., President Rosann Whiting, Honoree Kevin Hines, P '93, Principal Mary Jo Keaney and Honoree Barbara (Gaquin) Brandt '65, P '97, '07. A projector and screen for the Guidance Department. Any event of this magnitude requires the commitment and effort of many people. The 2012 Brescia Ball Committee includes the following volunteers. 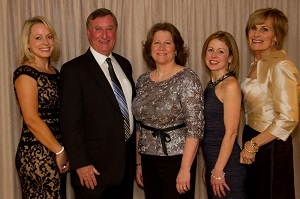 Held at Lake Peral Luciano's in Wrentham, the 2011 Brescia Ball was attended by 300 people who enjoyed a wonderful evening in celebration of the Academy and all the honorees have done for the school. Enjoy this photo slideshow from the 2011 Brescia Ball. All proceeds from the event helped to improve the technology infrastructure at Ursuline Academy. We completed the installation of interactive whiteboards in all classrooms in December of 2011 and the entire computer network on campus was updated during the summer of 2012. In 2010, proceeds from the Brescia Ball were used to renovate and update the Ursuline Academy library. The library technology is up-to-date, with eight brand-new computers--four Macs and four PCs--in addition to a Smartboard©. There are also new tables and chairs throughout the room, and separate study spaces for small group work. Honorees: Marianne LeBlanc ‘86, Michael and Donna O'Connor P ‘03, ‘08 and Past Principals of the Academy: Sister Rita Bourassa, o.s.u., Sister Dorothy Doyle, o.s.u., Sister Laurianne Michaud, o.s.u., Sister Mercedes Videira, o.s.u. In 2009, proceeds from the Brescia Ball were used to renovate and refurbish the locker room. New lockers were installed in the locker room and the lower hallway. Funds were also used to create the Bear Cave Wellness Center in 2011. 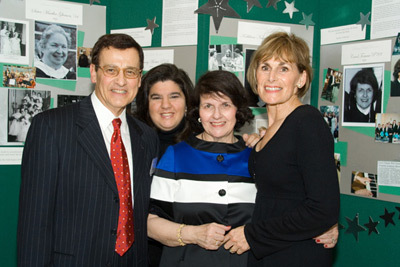 Marianne LeBlanc '86 (center) with her family. 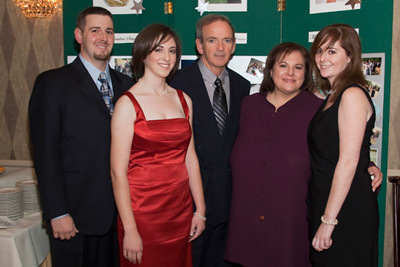 Michael and Donna O'Connor P'03, P'08, with their family. 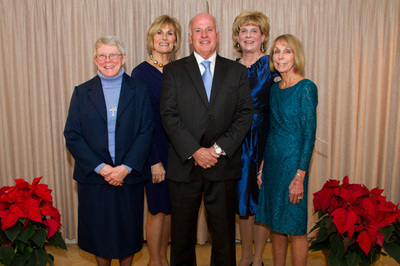 The Ursuline Principals. Present with us that evening were (From Left) Sister Mercedes Videira o.s.u., Sister Laurianne Michaud o.s.u., Sister Rita Bourassa o.s.u. 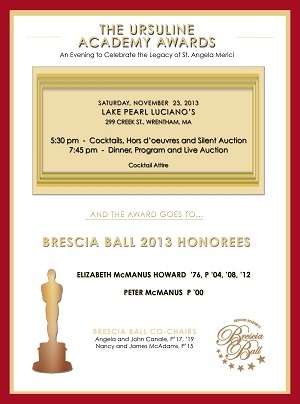 In 2008, proceeds from the Brescia Ball were used to purchase Smartboards© for several classrooms. Honoree Sister Martha Gleason '54 O.S.U. 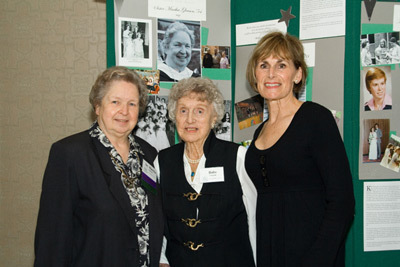 with her sister, Babe Gleason and President Rosann Whiting. 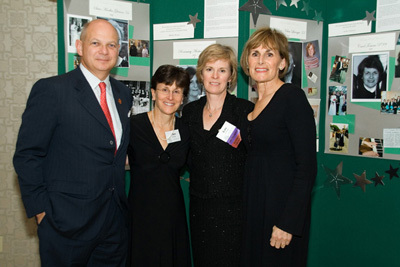 Honoree Mrs. Carol Tomase P'89 with her husband, daughter Holly Tomase '89 and President Rosann Whiting. 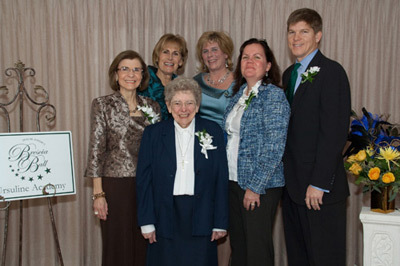 Honoree Kate Levesque '77 (2nd from Right) with her family and President Rosann Whiting. 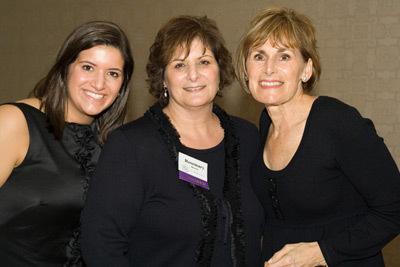 Honoree Rosemary Morteo P'08 with her daughter Alessandra Morteo '08 and President Rosann Whiting.